If you haven't heard of "When Calls the Heart" yet, you've been missing out on some great family entertainment! When Calls the Heart is a tv series produced by Michael Landon Jr. and based on the book series by Christian author, Janette Oke. To sum up: Elizabeth Thatcher, a new teacher from a wealthy family, travels west to teach in a small coal mining town. Set in 1910 in Western Canada, Elizabeth overcomes many obstacles, often with the help of the local mountie, Jack Thornton. Without giving spoilers, Season 2 is different from Season 1 in that there are storylines that take place in Coal Valley and storylines that take place in the big city of Hamilton, Elizabeth's hometown. This means that we are introduced to more characters -- specifically Elizabeth's family. Another difference between Season 2 and Season 1 is the addition of a mystery that weaves its way through multiple episodes... I'd tell you more about it, but then where would the mystery be? 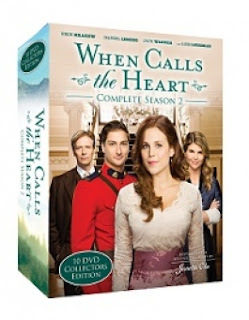 This boxset contains the episodes of When Calls the Heart as they aired on the Hallmark channel, but also contains a 2 for 1 movie-length version of the episodes so you can choose which way you would like to watch the series. What I like about When Calls the Heart is that this is family friendly entertainment at its best. While the storylines are compelling, they aren't extremely scary. Being set in the 1900s, everyone is on their best behaviour in terms of how they conduct themselves and how they speak. It's like traveling back in time! After my family finished watching season 2, Elijah, my 10 year old son, was so curious to find out what happens next. He could barely go to sleep that night! The acting in When Calls the Heart is superb and the characters are endearing. If you are looking for something heartwarming with innocent love triangles and a dash of suspense, this show is for you and your whole family. Check out: Fish Flix for When Calls the Heart DVDs as well as other Christian Movies "to inspire and entertain"! if you join their e-mail list.